Qatar-based United Development Company (UDC) has seen profits plunge in the first half of 2016 amid a softening home rental market. The Pearl-Qatar developer reported a net profit of QR353 million (UD$96.98 million) for the first two quarters of this year, down 39 percent from the QR577 million (US$158.52 million) reported at the same time last year. Ibrahim Al Othman added that to keep business going, the company has been working with unnamed “strategic developers” who are investing in several of the Pearl’s properties this year. So far in 2016, UDC has sold a tower plot in Viva Bahriya, various plots in the planned Giardino Villas and is in the process of selling one of the new Abraj Quartier’s commercial towers, which stand at the entrance of the island. In its statement, UDC said leasing of residential units at the Pearl went up 4 percent in the past six months, compared to the same period last year. While that growth appears small, it comes amid an overall decline in demand for luxury apartment rentals, real estate analyst Mark Proudley told Doha News. This is in large part because thousands of white-collar expats have left Qatar this year, due to belt-tightening layoffs and other opportunities. According to Proudley, the head of DTZ Qatar, many upper-end apartment towers around the country are starting to see vacancy levels in the double digits. “Rentals have also softened by around 5 percent to 10 percent, though a lot of landlords are offering tenants a rent-free period as an additional incentive,” he said. The Pearl has been no different. UDC has been offering a promotion on several of its apartments there, offering tenants two months’ free rent if they sign up for a 14-month lease. One bright spot for the Pearl has been retail leasing, which is up 39 percent from last year, UDC said. Commenting on this growth, Proudley told Doha News that this is likely due to the opening of Medina Centrale, a mixed-use walkable area with several midrange eateries, a cinema and new gaming center. Shops there are more “attractive to retailers than the retail available around Porto Arabia, which is spread out over long distances,” he said. Medina Centrale is the result of a strategy shift for the Pearl, which originally had a high-end focus. After sales slowed at upscale restaurants over an alcohol ban, UDC announced it would pivot to make the Pearl a “comprehensive, welcoming, flexible and balanced” place instead of a high-end, “heavily upscale” shopping hub. According to management, it will continue in that direction by opening an indoor shopping arcade inside of Medina Centrale called Souq Medina and welcome retailers at its new Abraj Quartier tower. Qatar’s largest real estate show opened its doors yesterday against the backdrop of a slowing economy and declining demand for homes, offices and retail space. But that hasn’t stopped several of the country’s largest developers from unveiling plans for entirely new “urban communities” and luxury homes – including a cluster of QR30 million villas on the Pearl-Qatar – at the annual Cityscape real estate conference, believing that there is still plenty of demand for high-end and upper-middle-class homes. The company – which made waves last year with its plans for a waterpark-themed residential tower in Lusail last year – unveiled three new projects yesterday, all of which are scheduled to be completed within three years, according to Ghaddaf. These include villas and complexes known as “The Bay,” branded as “the epitome of elite luxury living,” in La Plage South on the far end of the Pearl. All the villas have a private beach, while the apartments are built in a series of semicircular developments facing the water. Elsewhere, Al Bandary has also started to market its twin 28-story tower Lusail Azure development, which features “villa” units spread out across multiple floors. Al Bandary is also targeting middle-class residents with a new 77-building development dubbed Alswida Village, adjacent to Barwa City near Industrial Area Road in Al Thumama. 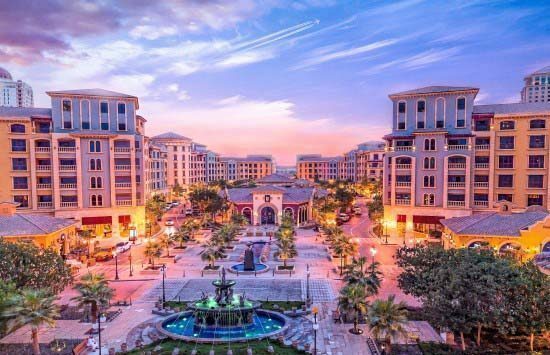 The suburban area is becoming increasingly popular among families in Qatar, especially as new streets – particularly F-Ring Road – make it easier to commute into central Doha and additional shops and schools open. “The whole area is growing into one for expats who want to pay an average rent and get a decent lifestyle,” Ghaddaf said. Al Bandary is looking to sell each of the six-floor buildings to other property firms or individual Qatari investors, who would then rent out individual units to tenants. Meanwhile, Ezdan Real Estate is building a brand-new town consisting of two schools, an office building, hypermarket, sports clubs, mosques, hundreds of shops and some 9,500 apartments in Wukair. The first 2,500 units of the Ezdan Oasis are scheduled to be completed by the end of this year, Kais Ouni, Ezdan’s senior sales and marketing executive, told Doha News. The remaining phases will be finished by the end of 2017, he added. Ouni said lower prices and easy access to amenities are encouraging more and more people to move to towns and villages outside Qatar’s capital. “People work in Doha, but prefer to live here,” he said. Unlike Al Bandary, Ezdan will own and manage its development and lease units to tenants directly. Ouni estimated that rents would range between QR5,000 and QR8,000 a month. Plans for these new projects come as developers wrap up construction on thousands of new housing units this year, which should provide some financial relief to tenants who have endured several years of rent increases that reached 10 percent in some cases. 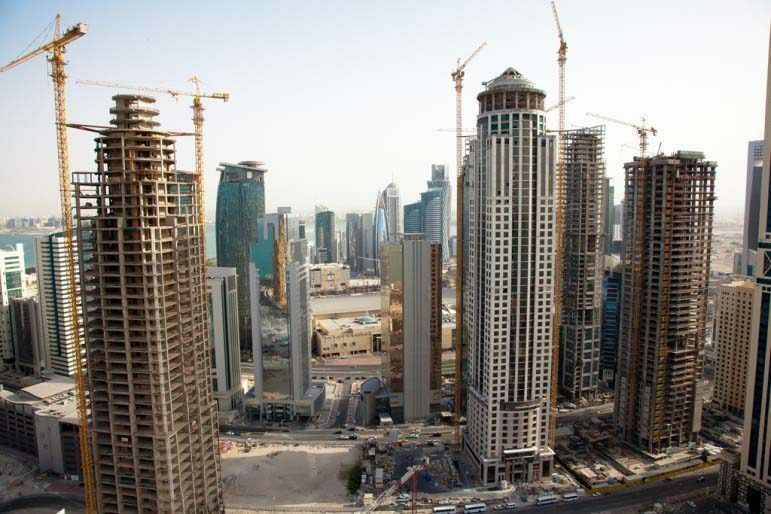 The supply of apartments in the Pearl, Diplomatic District and Lusail is expected to jump by one-third in 2016 to reach 22,000 units, according to real estate firm DTZ Qatar. At the same time, layoffs in the public and energy sectors have reduced the demand for high-quality residential accommodations, DTZ said in its latest market report, released at Cityscape. “The changing dynamics in the market suggest that recent signs of falling rents … may continue throughout 2016,” the company said. Although landlords may be reducing the rates of their vacant units, some residents say they are still being asked for more money when it’s time to renew their leases. And, even with a slight softening of rents, housing is still expensive in Qatar and consumes more than a third of the average household’s budget. Furthermore, much of the new residential construction in Doha has been of premium flats, meaning individuals looking for villas as well as affordable and centrally located flats may still find it difficult to find space.